Heat oven to 400 and place rack in center of oven. Line baking pan with wax paper or spray lightly with nonstick olive oil. In small bowl, combine the beaten egg with cream for glaze. Set aside. In large bowl, combine flours, sugar, baking powder, baking soda, and salt. Cut butter into ½-inch pieces and use pastry blender (or 2 knives or fingertips) to rub the butter into the flour mixture until it resembles coarse crumbs. Add cranberries and gently toss to coat. Combine buttermilk and orange zest in small cup. Make a well in the center of the dry ingredients and add liquid mixture. Gently stir with a wooden spoon until moist clumps form. Dough will be sticky. Gather the dough up with hands and transfer to a lightly floured surface. Gently knead the dough until it forms a ball and is smooth. Pat dough into a 7-inch circle and cut into 8 triangles using a sharp knife. 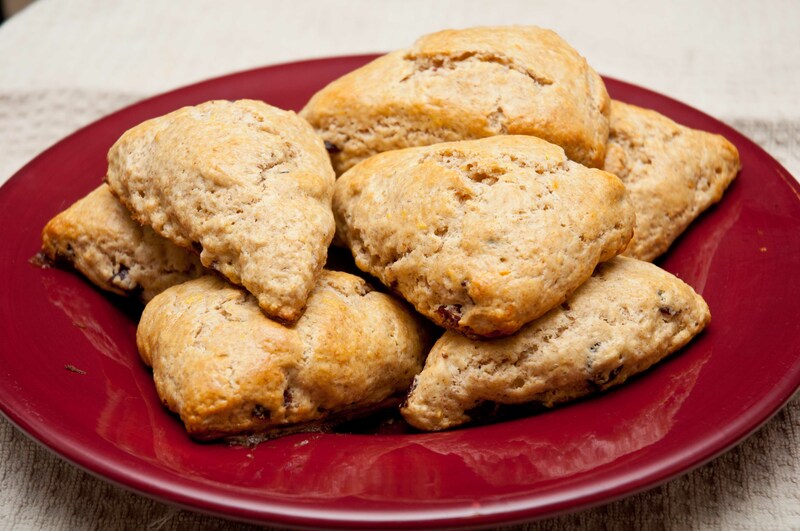 Place scones on prepared baking pan and brush with glaze. Bake in preheated oven for 15 minutes or until lightly browned (toothpick inserted in center of scone comes out clean). Remove from oven and cool on wire rack.